Musa but not sure which one. Anyone can help? Last edited by Simba17 : 05-26-2017 at 03:28 AM. Re: Musa but not sure which one. Anyone can help? ... Truly Tiny ... It grows about 24" to 36" tall. You also have at least 1 pup, may be 2 others (cant tell). Hello edwmax thank you for your answer. Yes there are two small pups. Do you know what type of musa is it? Tropicana or Dwarf Cavendish or maybe anything similar? I'm new to this plants and I love it. I want to plant them at home. Simba...go to wilko's web page and see if you can find it in the garden section. I did a fast looky loo. The plant is a dwarf of sorts but which kind ??? I did also..they sure got a lot of great stuff. But you may google these names in the future as that plant gets larger. Musa Nino, Truly Tiny, Little Prince,Tropicana, Super Dwarf Cavendish. Your new plant will require a lot of sunlight. For size reference here are some mature dwarf plants in containers. Yours will get to similar size. Front middle plant is Truly Tiny . dwarfed banana plants that only get to 36" tall are Super dwarf Cavendish. Sellers come up with different names to call it to enhance their sales. Cause there's a sucker born every minute. Ok thank you wolfebc. You gave me some idea. I like to know what to aspect. then feel disappointed later. I'm looking for some nice banana plant to have at home. Does anyone have any idea which banana type look great and exzotic and is good for home at the same time.? Thank you cincinnana. Very nice collection. I will keep in mind and wait till it grows. I will upload more pictures later. Then there is the Truly Tiny, which is 2ft (in pots) to 3 ft (in ground) tall and can bare eatable fruit. Another small size banana plant is the 'Little Prince' which is an ornamental banana that does not bare fruit. It grows about 18" to 24" tall. Google these for comparison. Your plant has a thick stalk for its size which is characteristic of the Truly Tiny. ... The Little Prince has a thinner stalk but a large bulge at its base. Your plant does not have the bulge. As already states, many growers/nurseries makeup plant names to boost their sales. Your plant was only labeled 'Musa', so I suspect the seller didn't know what type banana that was. ... Anyway the Truly Tiny and the Little Prince are the smallest banana plants that I know of and/or seen in banana cultivar references. Last edited by edwmax : 05-26-2017 at 11:15 AM. The Truly tiny banana plant is a super dwarf Cavendish sold under the name "Truly tiny". 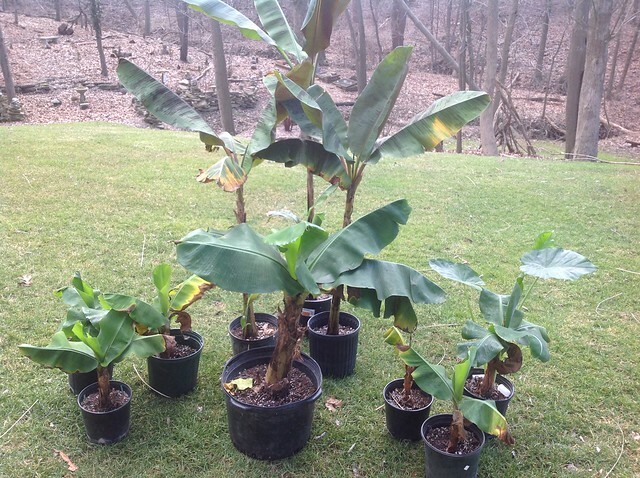 Beware of sellers offering seeds for these dwarf banana plants. They are obviously not real. What are those three larger plants in the back if I may ask? For fun you may double click on any of my photos in any post and it will take you my safe Flickr account. From there go to albums and feel free to browse. I put a few pics in your pm so you may see the full size of this plant. Have fun and thanks for looking!! Last edited by cincinnana : 05-26-2017 at 07:54 PM. Previous Thread: Sikkemensis red tiger or Darjeeling giant?